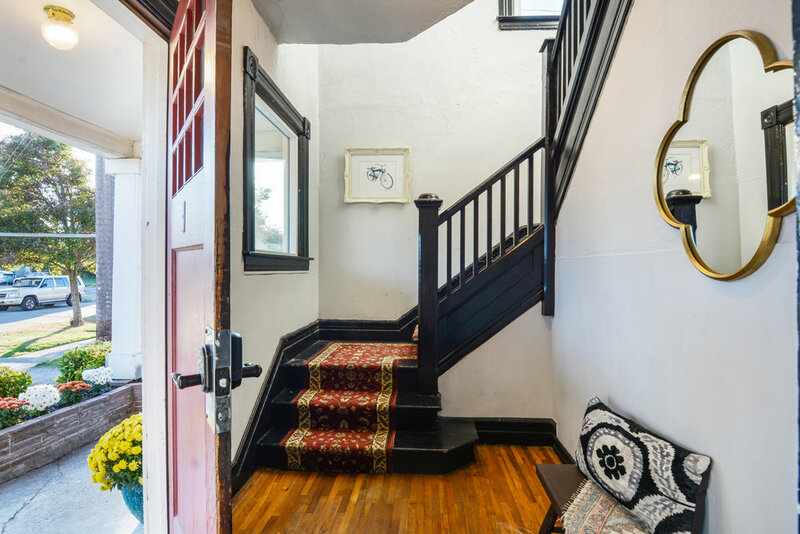 From the front porch step into the shared entry space with its hardwood floors, open staircase, and high ceilings. Covered front porch with flower boxes and shared entry for the 2 units inside this home. 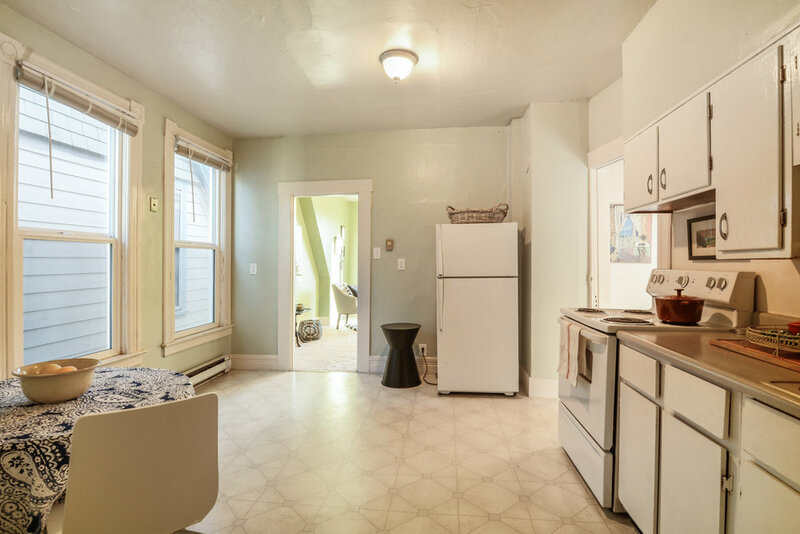 Opportunity is the word that comes straight to mind with this North End duplex. Half a mile from University of Puget Sound, and one block from the heart of the 6th Ave District, walk to local coffee roasters, cafes, bars, ice cream, tacos, pizza, vintage, records, salons, and schools! Another word that comes to mind is possibility. There’s investment potential here, there’s the possibility to live in one unit, rent the other, the possibility to create a mother-in-law arrangement with a friend or family, even the possibility to reimagine and remodel back to a single family home as the house was originally designed to be. Opportunity, possibility, and investment. Okay, those are idea words, but what are we working with? Right now, we have a property separated into 2 rentable units. 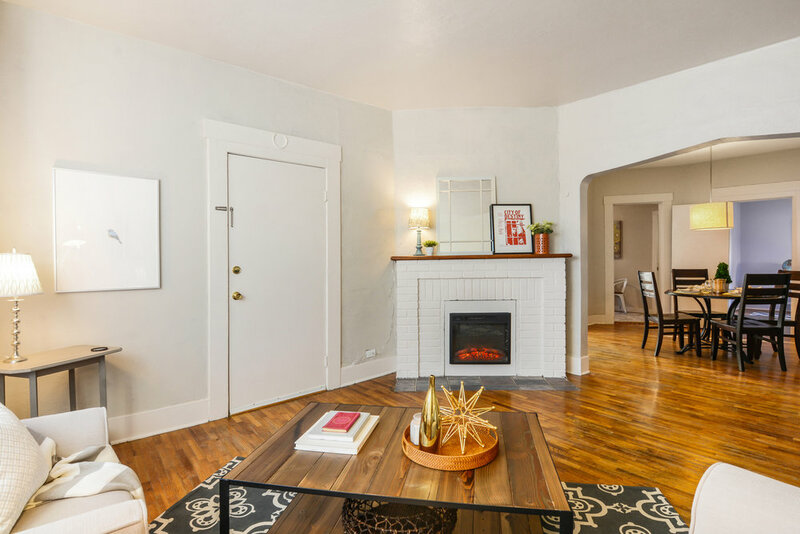 The 2 bedroom main floor features hardwood floors, a big front bay window, an electric fireplace, a laundry room off the kitchen, an updated 3/4 bathroom, and a lovely Tudor arch between the living and dining rooms. Upstairs, find a one bedroom with a spacious eat-in kitchen, bright living room, a clawfoot tub in the full bath, and big windows. There’s even off street parking for 2 vehicles in the back. The lot is small with a low maintenance front yard and so much neighborhood walking to explore! 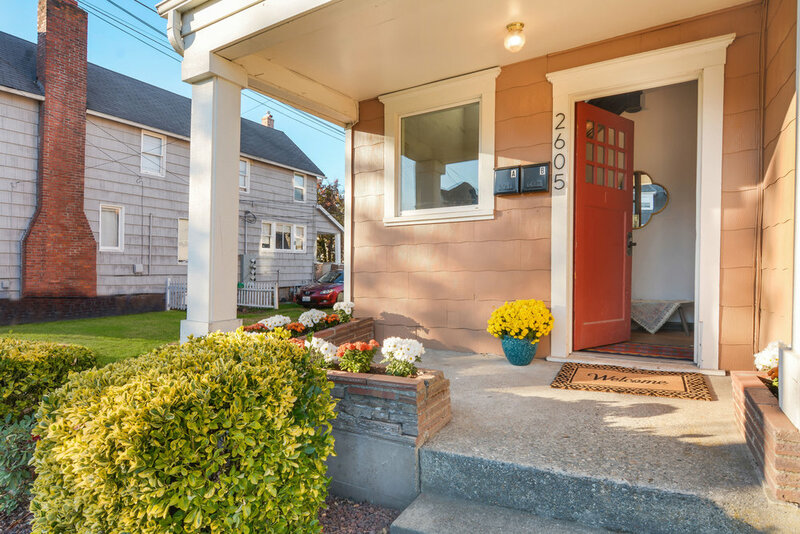 Continue on for the video tour, photos, neighborhood highlights (including walking and driving time/distance to a list of Tacoma favorites), and many more details about this home. Main floor apartment with bay window, hardwood floor, fireplace, and its own interior front door from the shared entry area. At the top of the stairs a private front door for this apartment leads into the living room. This living room is brightly lit by the big bay windows at the front of the home. The living room connects to the dining room with a pretty Tudor arch. A stone hearth, white brick fireplace, and wooden mantle keep things cozy. The main entrance to the duplex is through the front door on the covered porch facing 8th Avenue and is shared between both units. Step inside the hardwood entry area with high ceilings and an open staircase. Take a right and you’ll find the front door to the main floor apartment. The hardwood floor living room flooded with light from its tall bay windows greets you. A white brick fireplace with a stone hearth and wooden mantle create a cozy atmosphere and the tudor arch leading to the dining room adds grace. The arched opening along with the 2 tall windows give a nice amount of space and light to the room. The dining room is also covered in hardwoods and you’ll notice tall trim, old-school solid wood millwork, and vintage touches. The dining room is the hub in this apartment. From it, enter either bedroom (where the hardwood floors continue), move easily back and forth from the living room, or head into the kitchen. Hardwoods continue in the dining room which is the hub of this unit. You can see here both bedroom doors with the entry to the kitchen in between. The second main floor bedroom could also be set up as an office or studio. 2 bedrooms in this apartment offer flexibility. Use both as bedrooms or allow one room to be an office, writing space, yoga room, or guest space. These bedrooms are both accessed from the dining area, but the kitchen is between them, so they don’t share any walls, giving a sense of space and privacy. One of two main floor bedrooms with hardwood floors and 2 nice big windows. Wooden cabinets, a window facing west over the sink, and easy to clean vinyl floors complete the kitchen. The kitchen features wooden cabinets, a west facing window over the double sink, a refrigerator, stove, and dishwasher, and easy to clean vinyl floors. Open a door from the kitchen into the laundry room with a washer and dryer. The laundry area has a back door out to the parking area, providing a second exit for this apartment. The main floor kitchen is complete with refrigerator, stove, dishwasher, and ceramic double sink. The bright laundry room is located conveniently off the kitchen. The main floor apartment includes this laundry room entered from the kitchen. The back door exits to the parking area at the back of the lot. When first stepping into the kitchen from the dining room, turn right immediately and you’re in the 3/4 bathroom. Updated in a clean and simple style with white, blue, and gray, the room has all the necessities, a white shower surround with glass doors, a vanity with cupboard storage, and a window that opens for fresh air flow. 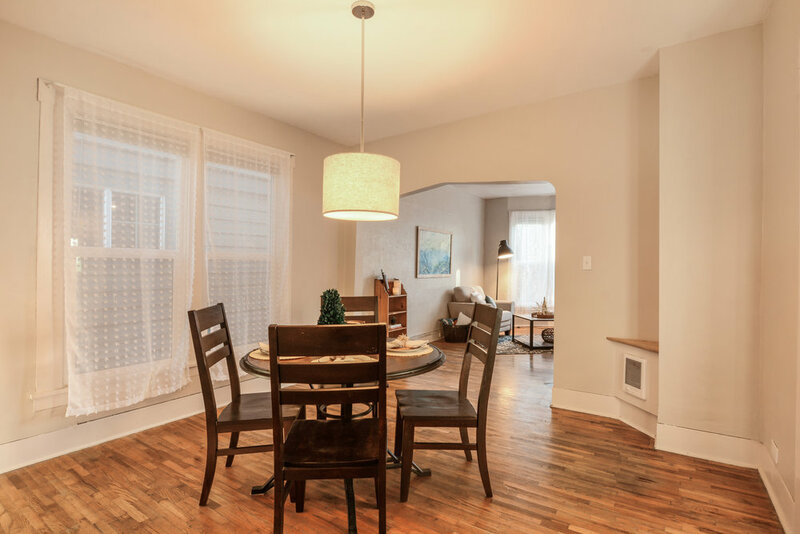 With outdoor access at front and back, vintage charm, hardwoods, and open living space, this main floor unit provides comfort and character in the North End. Main floor 3/4 bath is updated in a clean, simple style. Vinyl floors, bright white shower surround, storage in the vanity, and a window that opens at the back. Welcome to the second floor apartment. At the top of the stairs a private front door for this apartment leads into the living room. A door in the living room opens into this tiny room that can be used as a storage closet, or maybe a secret reading nook to keep that window from going to waste. A big south facing front window brings brightness to the living room. We're looking into the room from the entrance to the kitchen. From the shared front door entry, turn left and climb the open staircase brightly lit by windows and find the door at the top of the stairs. A living room with a huge front window and a second square window set high in the wall welcome you to this unit. 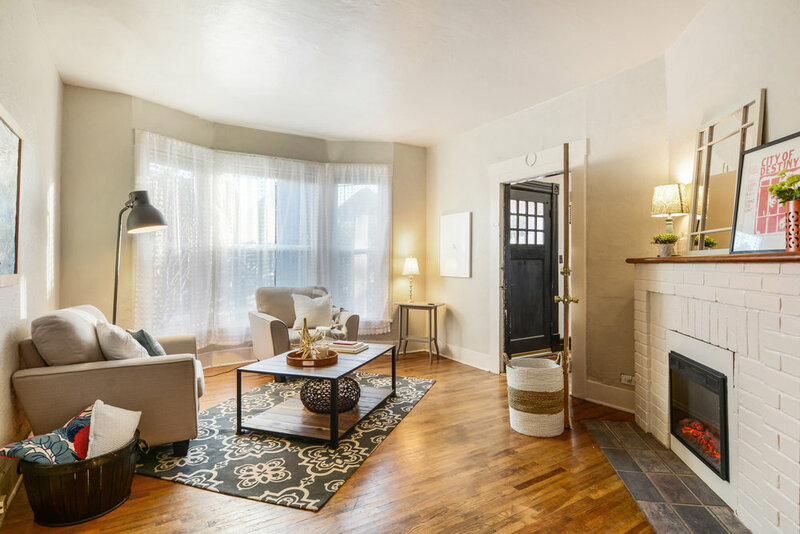 This south facing room is a cozy spot to set up your couch and coffee table, and you’ll notice a door in the wall. Open that to find what could be a storage closet, or set a little desk and chair or beanbag inside to create a secret nook. A window shines down from the slanted ceiling, so you’ll even have a bit of view in there. From the living room, walk through to the eat-in kitchen. There’s space here for your table and chairs, as well as a kitchen cart or butcher block to expand your work space. Two large windows and a slanting wall bring shape and interest to the room, and a pantry ensures you’ll have a good amount of food storage space so you can use the cabinets for dishes and kitchen tools. The kitchen includes a stove, refrigerator, stainless double sink, and a neutral vinyl floor. The 2 big windows and slanted ceiling over the table bring light and character to the kitchen. The second floor eat-in kitchen has plenty of room for a table and chairs. There's a refrigerator, stove, pantry, and stainless double-sink. Having a pantry frees up more space in the cabinets for dishes and kitchen tools. Looking from the pantry through the kitchen back into the living room. Notice there's plenty of space to add a kitchen cart or butcher block in here. From the kitchen step into a small hall with the bedroom and bathroom. The bathroom is set with a clawfoot tub and shower, white vanity with a cupboard, white wainscot, and some fir trim detailing for a nice Pacific Northwest touch. Here you’ll also find a cabinet mirror and window that slides open for fresh air. The upstairs apartment has a full bath with a clawfoot tub, wainscot, a window that easily slides open, and storage within the vanity and mirror cabinet. The bedroom is at the back of the house with windows on the north and west sides of the room. These open up, and along with a ceiling fan, create a comfortable space with nice light. This is a solid one bedroom, one bath apartment in a location where morning coffee and doughnuts, as well as night life are just a 3 minute walk away! The second floor bedroom with windows facing north and west. This home sits on a small, low-maintenance lot. A front lawn, shrubs, a covered porch, and wide planting strip beside the curb make up the yard. In back you’ll find 2 off street parking spots as well as a tool or storage shed attached to the house. This is a no fuss lot, but an enthusiastic gardener could certainly redesign and develop the front lawn and planting area with flower beds, raised beds, and landscaping as others in the neighborhood have done. One more look at the front yard of this home in Tacoma’s North End, just one block from the fun of 6th Avenue. The lot offers off-street parking spots for 2 vehicles. You also see here the door into the laundry room, and beside it the door to the basement. There's also a tool/storage shed attached to the back of the house here. 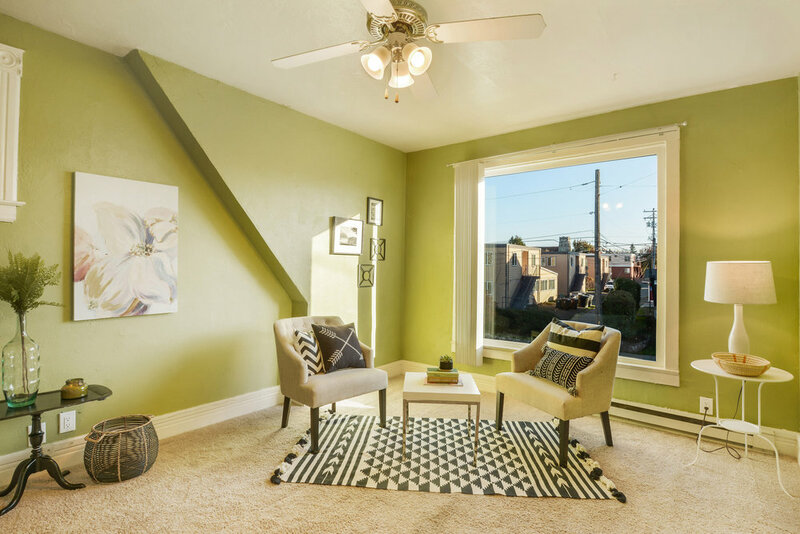 This duplex is situated in a residential North End neighborhood just north of the lively 6th Ave district, home to restaurants, coffee roasters, vintage shops, bars, and an eclectic population. To the west is the idyllic University of Puget Sound campus which brings a college town energy to the area. There’s a lot of variety to the homes here. You’ll find duplexes like this one, apartments (especially between 8th Ave and 6th Ave), and lots of old single-family homes with that certain character and charm only history can bring. There are several schools close by. We mentioned the University of Puget Sound half a mile away. Just north on 10th Ave, Tacoma Public Schools is rebuilding Grant Center for the Expressive Arts Elementary School, so there will be a brand new school within a 2 minute walk! Other nearby public schools include Jason Lee Middle School, and Bryant Montessori School. 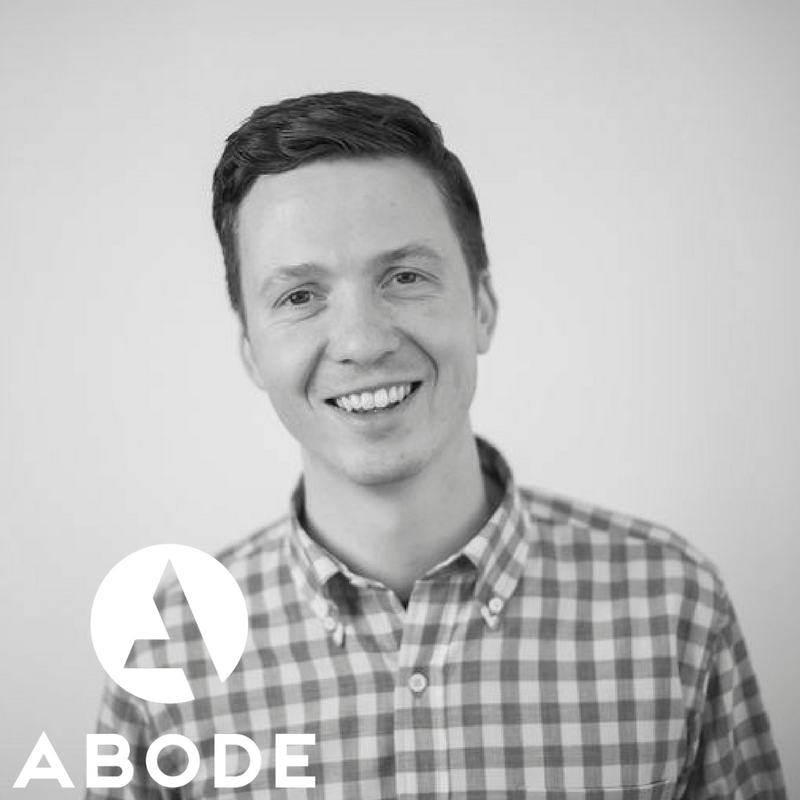 Read more about 6th Ave on our Tacoma Neighborhoods page. And take a look at all the places within easy walking and driving distance below. 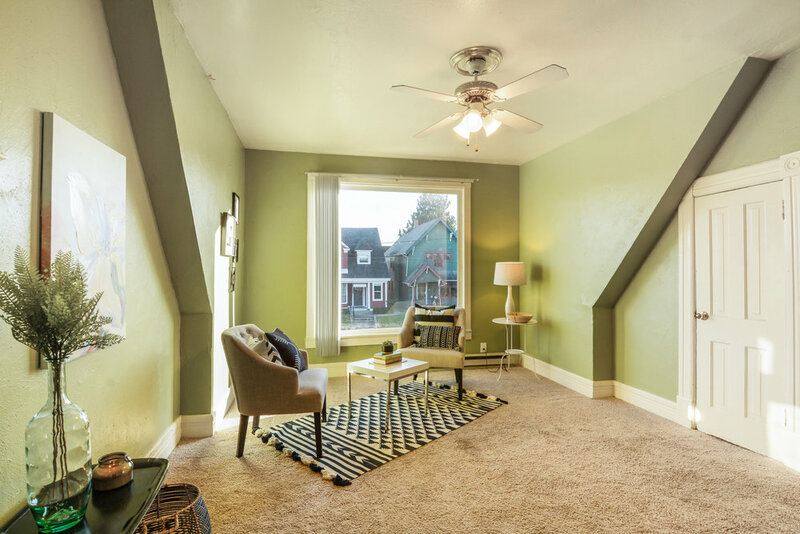 For more information about this duplex one block from the eclectic 6th Ave District and less than a mile from the University of Puget Sound, call or text me at 253-226-2787. I'll be happy to answer your questions about this home or the Tacoma real estate market in general.